No longer tethered to our desks by a wire, we will become a more mobile workforce with employees enjoying more of a “Live-Work-Play” lifestyle. Image courtesy of Death to Stock. Change management may not be new, but today’s office dynamics are. 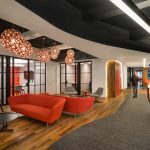 To drive innovation and attract and retain top talent, companies are seeking creative, “cool” workplace solutions that offer a variety of amenities and the latest technology. Of course, open offices also continue to be a popular choice due to the cost savings of a reduced footprint—and with rents in the Bay Area on the rise, that fuels the movement from traditional workplaces into more open, collaborative spaces. Yet, while the office of the future is a reality today, many employees are anxious about change, and some aren’t ready to give up their privacy. Fortunately, there is a time-tested way to address these issues: change management. Without change management, you risk damaging company morale and undermining performance, which will hurt your bottom line. With significant financial investments at risk, a comprehensive and customized change management strategy can be vital in the success of workplace transformation. Before we review how to develop and implement a change management strategy, it is important to note that the process really starts with designing the kind of workplace that takes into account how space can best accommodate function. In other words, show employees that you have considered their task-related needs from the start! Communication throughout the process will build trust and give employees time to digest and provide constructive feedback. Image courtesy of Death to Stock. At its core, change management is about involving employees in the solution development and decision-making process. By giving them a voice, they will feel included and more receptive to change. This will also help ensure that the end result reflects their input, needs, and desires, which is critical as the line between work and home becomes more blurred. How much you engage your employees depends on the extent of the transformation and the departure from your current space. However, regardless of the size of the project, it is important to involve your employees early on. Communication throughout the process will build trust and give employees time to digest and provide constructive feedback. In contrast, asking employees to adopt changes that they had no involvement in will likely cause friction and resistance. There is no such thing as a one-size-fits-all change management plan. Senior management has a seemingly endless pool of options for how to engage employees in the decision-making process. Traditional methods include sending email updates, forming a core project team, interviewing key employees and stakeholders, and creating design mockups. More modern and tech-centric methods include podcasts, video updates, and an Intranet where employees can view plans and provide feedback. What is the company culture? If there is already a foundation of trust between employees and upper management, staff will feel more comfortable communicating concerns and be more receptive to change. If there is a divide, employees may see the proposed changes as a “top-down” decision they have no say in, causing resistance. In cases of extreme pushback, more drastic forms of engagement, like an employee summit, may be necessary to implement change. What are the demographics of your employee base? Most companies have a mix of Millennials, Gen X, and Baby Boomers—and increasingly, Generation Z is joining the workforce. With diverse experiences and tech know-how, each generation will likely have different concerns, and this should all be reflected in your proposed solutions. Tied to the above, how tech-savvy are your employees? The tools you use should reflect the forms of communication your employees are comfortable with. For a responsive, comprehensive plan, a mix of traditional and more modern methods is suggested. What is your budget? Be sure to incorporate both direct expenses like equipment and indirect expenses such as time your employees may need for interviews or meetings. A set budget will help you narrow your options. Considering these points will help ensure your change management plan is customized for your company’s culture and budget. Although the open office has become more mainstream, some employees, especially senior managers, may still feel uneasy about switching from private offices to collaborative space. While lack of privacy is a part of their apprehension, they may also fear that giving up their office means compromising their status. As workplace design becomes less hierarchy-driven, it is important to assure people that their role within the company will still be recognized. Additionally, many don’t realize that open offices are often a hybrid of shared and private space that meets a wide range of needs. So be prepared for initial pushback and possible anger from employees, but keep in mind that with proper communication, education, and patience, you can change their perspective. In a guided workshop activities can help staff look at how they work today and how they could work in alternative settings. Employees might be asked to visualize and create their perfect office. They might be provided with tools to illustrate that space, tools like – pipe cleaners, Legos, construction paper, and other building materials. Working in teams or alone, this will force employees to think about how they can work differently. It will also give you and your team critical feedback. Take employees on a tour of an open office. This may be within the company on another part of campus or in an office within your industry. Give them time to chat with employees who can help ease their fears about privacy and distractions. Present proposed changes to employees through digital models, blueprints, or a PowerPoint presentation. Then, candidly review the designs and address needs and concerns. Ask them what they would change and why, if they think anything is missing or unclear. This will help employees see how open designs can be more efficient and productive, while still offering a degree of privacy. It can also shift your employees’ viewpoint about the planned changes and serve as great team-building exercises. As technology and workplace demographics continue to evolve, the office will continue to transform to accelerate the production cycle, attract and retain talent, and optimize performance. No longer tethered to our desks by a wire, we will become a more mobile workforce with employees enjoying more of a “Live-Work-Play” lifestyle. In short, project management and change management are no longer separate entities. They must work in synch from start-to-finish to ensure successful projection execution. While some companies have a project management discipline in-house, companies typically outsource this function to specialists. So, plan ahead and consider an experienced project management firm that provides change management as a part of its services. No matter your industry or location, with patience, due diligence, and a customized change management program, you can make the workplace of the future work for you today.